The only thing to be kept in mind is that you only tax people who have work. Unemployed or homeless are not taxed - it’s the most socially world city the universe has ever seen - I know. Taxes are collected from your working population. Population growth helps your economy by allowing you to gather more recources and collect more gold from taxes. Currently the only way to effect happiness is through Taxes. 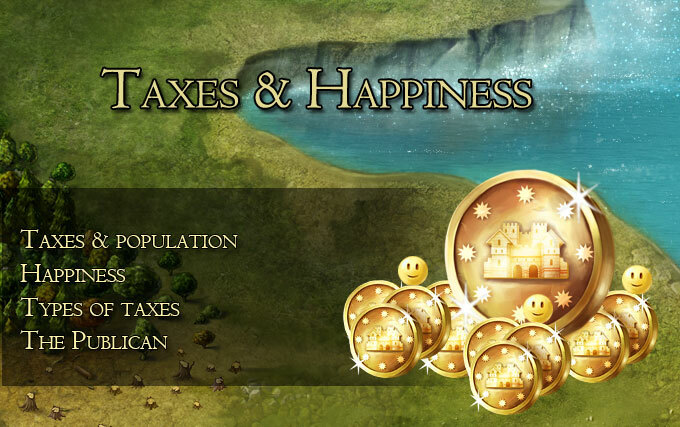 There are 5 types of taxes - Tolerant tax is available when you enter your empire. The other tax types can be unlocked by researching the 4 levels of Governance. Tax types can affect your gold income, happines and resource production. 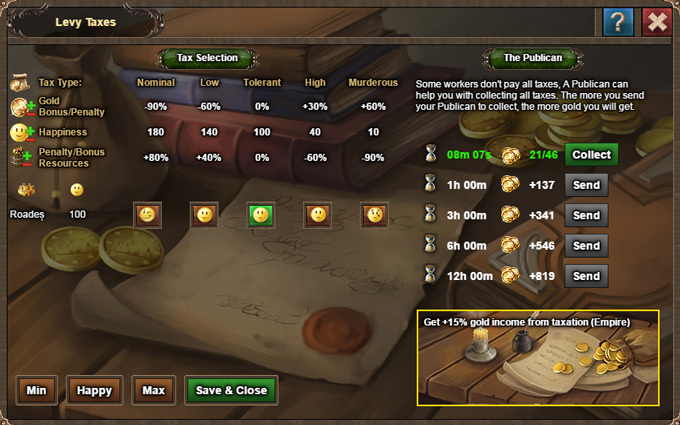 The more gold you collect from a tax type, the higher the resource production penalty will be. It is entirely up to you to manage the income, production and happiness of your Empire. You can use the "Min", "Happy" or "Max" to quickly change between these 3 types of taxes. This change affects all cities in your Empire. When you are done just apply your changes by clicking the "Save & Close" button. Not all taxes get collected. Thanks to the Publican the taxes that the people try to hide can be collected. You can send him to collect taxes for you whenever you wish. The Publican can be sent to collect hidden taxes again all you need to do is to collect the gathered taxes and send him again after he completed his round.